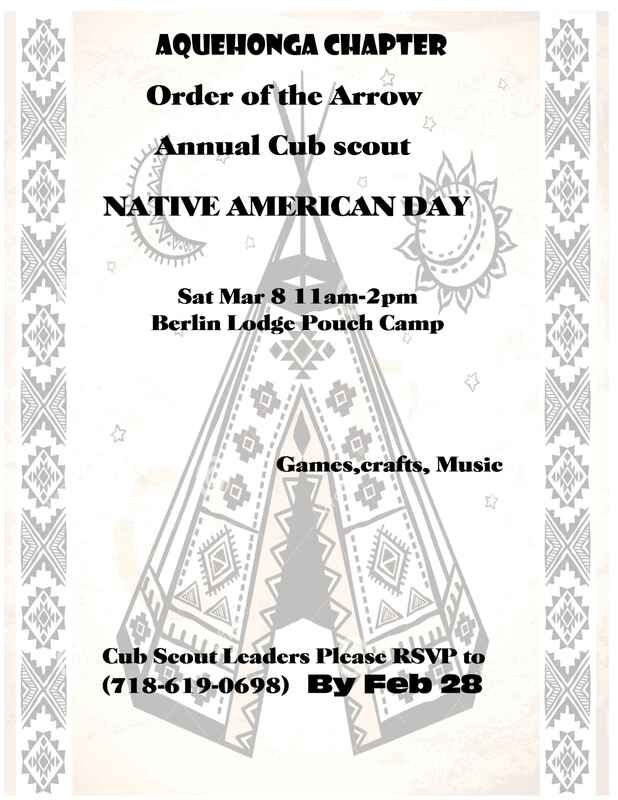 ALL scouts and their families and friends are welcome. The Famous Gazinski Pancakes will be served. See attached flyer. SEE YOU THERE ON THE CHOW LINE ! Our Order of the Arrow transition team is excited to announce the new identity of the Greater New York Councils Order of the Arrow Lodge. After considering the results of the online opinion poll conducted in December 2012, the members of the transition team voted to name the Greater New York Councils Order of the Arrow Lodge, Kintecoying Lodge #4 on January 6, 2013. Kintecoying is translated as “Crossroads of Nations”. If your Troop would like to have the members of the Order of the Arrow come down to your troop meeting to conduct an election, please contact John Perchiacca at rxjjp@aol.com. We will be conducting visitations until the end of April. NO ELECTIONS WILL BE HELD AFTER April 30th. Native American Crafts and Games. Please contact Camporee Chief Michael Feminella at mfeminella@verizon.net or (917) 705-1621 with any questions.